I've had the privilege this year of reviewing a couple of wonderful books which take inspiration from the world war and now with the Armistice Centenary getting ever closer, I have been given the opportunity to read another poignant tale, White Feather by Catherine & David MacPhail. But this is a WW1 story with a difference. The First World War is over, but for Tony there is little to celebrate. His brother never returned from no man's land. To make it worse, Charlie died not as a hero but was executed as a coward. Grief-stricken Tony refuses to believe that his brother was a traitor, and he is pushed to the edge in his dark quest to uncover the horrifying truth. Now I mentioned at the beginning of my post that this was a World War 1 story that wasn't quite the same as ones you've probably read previously. Most stories will focus on perhaps the war itself and the heroes that bravely fought throughout this terrifying time but we never hear much about those who chose to flee, who are seen as deserters of their country . . . But for Tony, this is something he has to face head on. Not because he himself has not been brave enough but because of his older brother Charlie who was found in the trenches in a compromising position, now in death he is seen as a coward. However we all know that things aren't always as they appear. A grief-stricken quest for justice in the wake of WW1, from a mother-and-son writing team. The story begins at the end of the war, when the soldiers were coming home. A moment being celebrated by many. But there are those who are left with mix emotions, with family members unable to return home as they died fighting for a great cause. So hard to feel sadness and pride all at the same time. Not wanting to cry, he's sixteen now, a man and men don't cry and those around him believed that his brother had run away from the battle field instead of standing his ground and fighting the enemies around them. A point proven when a stranger places a white feather in Tony's hand, the sign of cowardice. "Tell the truth," Tony blurted out at last. "You know the truth." Despite what they'd been told, Tony can't shake the feeling that the truth wasn't being told, his brother was the bravest person he knew. A feeling confirmed when he discovers a letter addressed to himself and his ma with a hidden message that he manages to decode - Fortune Knows Truth Make Him Tell. A message from the grave? Tony just can't ignore what he's read and sets himself a mission of setting the record straight but to do that he needs to find this man, Fortune. What does he know about Charlie? "Everyone said this was like nothing that had happened before. It was hell - a living nightmare." Aimed at children aged 8+, this is part of Barrington Stoke's super readable range. I would say it is better suited to children aged between 10-12 purely because of the subject it surrounds but I have to say for a short story it is very cleverly written. 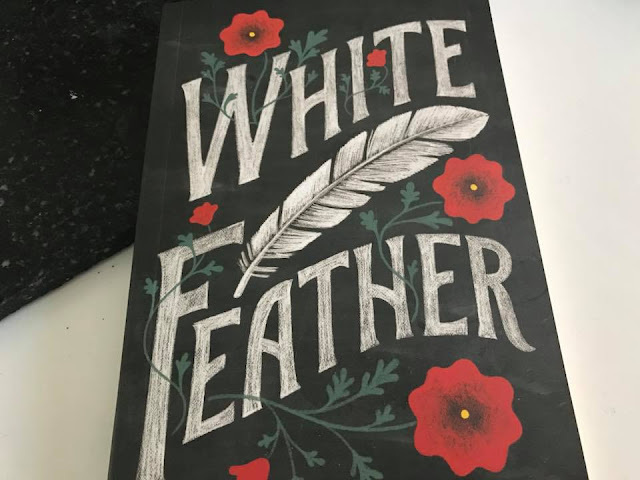 White Feather is quietly powerful and a great book for bigger discussions about the war. Not just about the battles but about the emotions involved in such large events. I'm now giving this book to my 10 year old as she'll be studying WW1 in her class this term and I think this could add an extra depth to an already fascinating part of our history. I was surprised when you said it was a children's book as well. I really want to know what happened now!